The City is divided. The bridges gated. In Southside, the hostiles live in squalor and desperation, waiting for a chance to overrun the residents of Cityside. Nik is still in high school but destined for a great career with the Internal Security and Intelligence Services, the brains behind the war. But when ISIS comes recruiting, everyone is shocked when he isn’t chosen. There must be an explanation, but no one will talk about it. Then the school is bombed and the hostiles take the bridges. Buildings are burning, kids are dead, and the hostiles have kidnapped Sol. Now ISIS is hunting for Nik. But Nik is on the run, with Sol’s sister Fyffe and ISIS hot on their trail. They cross the bridge in search of Sol, and Nik finds answers to questions he’d never dared to ask. The Bridge by Jane Higgins is definitely an award-worthy story in its own right. Winner of The Text Prize this intricate novel weaves heavy themes such as political power, friendship, self-identity and survival into a perfectly executed example of writing at its finest. In this novel, Nik and his fellow classmates of Tornmoor Academy live in a world where their city is at war. There’s the Southside where the hostiles live in desperate, harsh conditions and are fighting to cross the bridge to Cityside, where ISIS controls the area and keeps the hostiles at bay. ISIS comes to Tornmoor Academy to recruit the finest for their cause and immediately after being denied by this elite command, Nik’s school is bombed and he finds himself on the run with his best friends Dash, Fyffe and her little brother Sol. As the story progresses and suddenly Sol is kidnapped by Southside, Nik and Fy infiltrate the Southside camp and uncover details about the war that Cityside has so masterfully concealed. Nik was a flawless narrator for this novel. He makes the story shift and flow at a deliberate pace that makes you feel like you need to work for the details and answers and when they unfold, there’s a sense of fulfillment that kept me digging for more. I loved his quiet strength and constant determination; and my heart broke for him at the end when he was faulted for something that truly he didn’t deserve. Nik and Fy were the true champions in this book and I commend Jane Higgins for not clouding their story with a needless romance, but rather a genuine friendship. There are other characters that deserve a standing ovation, but for this review I’ll dedicate the stage to my favorite ones Nik and Fy. There is so much about the ending of this story that screams for a sequel. I want to know who the Academy’s insurgent was? I have my guesses, but I want them confirmed. I want to know what will come of Fy. I fell hard for her character and really came to care for her cause and her values. I’m curious what will come of Dash and Jono despite not caring for them as much. The Bridge was great, but I feel there’s more to tell. Overall, I enjoyed every aspect of this story and I’m hoping there’s a sequel to ease my mind. Awesome book! 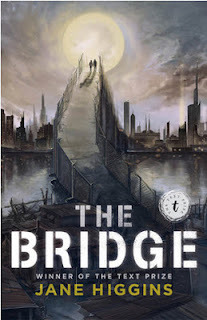 The Bridge Giveaway is open INTERNATIONALLY!! Sooo, if this sounds like an Aussie book you can enjoy, fill out the rafflecopter and tell us about the book you're currently reading. Good luck! Please note: If you win and live outside the US or Canada, please allow for a longer delivery time than what our giveaway policy states. Thanks! I've yet to read Under the Never Sky. Hope you're enjoying it. It's quite intriguing so far! Hey! 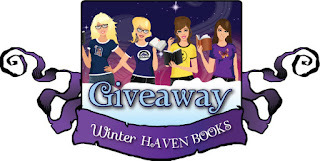 how did you add the GFC like that to your rafflecopter giveaway? I'm currently reading Venom by Fiona Paul. Thanks for the giveaway!! I haven't heard of Venom. Hmmm, must look into it. You're welcome and good luck! You're welcome! I have Poison Princess on my "must read soon" queue. My roomie is reading it right now. :) You're welcome! I am reading The Age of Miracles by Karen Thompson Walker. I heard that was good! I hope you're enjoying it. You're welcome! Aussie books are among the best IMO. :) You're welcome and good luck Jasprit! Are you going to watch the movie? You're welcome and good luck! I am reading Ella and Micha by Jessica Sorensen and so far I am loving it. My roomies LOVE Julie Kagawa. Thanks for posting Brooke! I've only read Mockingjay once, but the other two at least 3 times each. Love love love that series! Thanks for posting Taylor!! Im reading the Crusade series by Nancy Holder and Debbie Viguie. I haven't heard of that book. I have to check it out! I am reading Slide by Jill Hathaway right now. Thanks so much for the chance to win! I'm currently reading The Home by Scott Nicholson. I'm reading The Twelve. It is really good so far. I'm very slowly working my way through Demon Keeper by Royce Buckingham. It's on eFormat and I'm realizing more and more that I prefer physical books. I read them much quicker and it feels more satisfying. I haven't heard of the first, but I have read the second. Thanks for stopping by Amber! Good luck with the giveaway!